Eukanuba Healthy Extras help support total body health and are specifically tailored for your adult dog. They help provide key nutrients in six performance areas (Bones & Muscles, Heart, Skin & Coat, Digestion, Teeth, Immune System) and your dog will love the great taste. Biscuits are designed as an additional food source, 2-4 biscuits a day in combination with Eukanuba dog food will deliver the benefits. Wheat Flour, Dried Chicken And Turkey, Animal Fat, Dried Beet Pulp, Fish Meal, Brewer's Dried Yeast, Dried Whole Egg, Chicken Digest, Sodium Chloride, Potassium Chloride, Linseed, Dicalcium Phosphate, Calcium Carbonate. 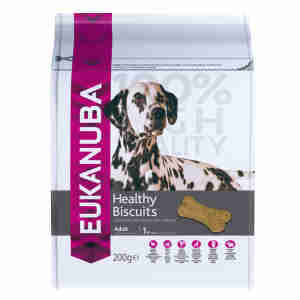 Eukanuba Healthy Extras help support total body health and are specifically tailored for your ageing dog. They help provide key nutrients in six performance areas (Bones & Muscles, Heart, Skin & Coat, Digestion, Teeth, Immune System) and your dog will love the great taste. Biscuits are designed as an additional food source, 2-4 biscuits a day in combination with Eukanuba dog food will deliver the benefits. Wheat Flour, Dried Chicken And Turkey, Dried Beet Pulp, Animal Fat, Brewer's Dried Yeast, Dried Whole Egg, Chicken Digest, Fish Meal, Sodium Chloride, Potassium Chloride, Linseed, Fructooligosaccharides, Calcium Carbonate, Glucosamine Hydrochloride, Chondroitin Sulphate. Eukanuba Healthy Extras help support total body health and are specifically tailored for your puppy. They help provide key nutrients in six performance areas (Bones & Muscles, Heart, Skin & Coat, Digestion, Teeth, Immune System) and your dog will love the great taste. Biscuits are designed as an additional food source, 1-3 biscuits a day in combination with Eukanuba dog food will deliver the benefits. Wheat Flour, Dried Chicken And Turkey, Animal Fat, Dried Beet Pulp, Fish Meal, Brewer's Dried Yeast, Dried Whole Egg, Chicken Digest, Dicalcium Phosphate, Sodium Chloride, Potassium Chloride, Linseed. I have been buying these treats for some time and our labrador loves them. However since the beginning of the year this product has been subject to a large price rise, a 700g bag used to be £3.40 - check the price of the replacement 200g bag for yourself. This is not a criticism of Pet Supermarket but of Eukanuba. I am now looking for a replacement and will not be ordering this product again. Every dog we've had, loves these, even before Eukanuba rebranded them as healthy extras. My 5 month old puppy Milo loves these treats more than any other, and they`re healthy as well!!! My puppies love these treats and their mum too! These treats are their favorite out of all. There also great for their teeth, cleaning them as they munch away at the small biscuts. I always make sure I have got some of there favorite treats. Our golden retriever is absolutely crazy for them, gets excited like a puppy, jumps and starts crying for them! He`s 11 so we usually buy the light ones.